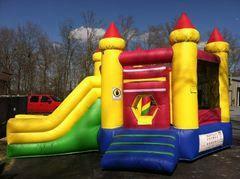 Rent this brand new castle combo w small rock wall and small slide for only $190 !!! Great for ages 9 and under !! 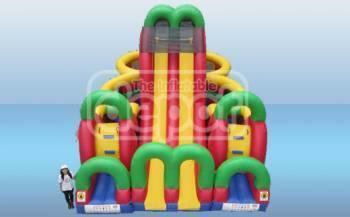 Have a great time with this 3 in 1 bouncer!Bounce, climb and slide. ***ATTENTION !! Your reservation is not completely confirmed until a Number 1 Party.com rep contacts you. WHY? Because sometimes rides are available but there is not enough workers to get the rides in all the different places. For instance we could have a bunch of parties in Birmingham and you could reserve a ride in Stevenson and that could be a situation where we are to spread out with our workers. We do however try our very best to fulfill ALL our online reservations. Please be assured that this is very very rarely an issue. A Number 1 Party.com rep will contact you via phone or email within 24hrs of your reservation. 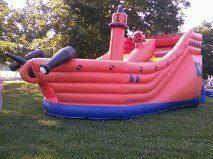 Have a great time with this 3 in 1 Pirate Ship bouncer!Steer the ship or shoot the cannons.Bounce, climb and slide. ***ATTENTION !! Your reservation is not completely confirmed until a Number 1 Party.com rep contacts you. WHY? Because sometimes rides are available but there is not enough workers to get the rides in all the different places. For instance we could have a bunch of parties in Birmingham and you could reserve a ride in Stevenson and that could be a situation where we are to spread out with our workers. We do however try our very best to fulfill ALL our online reservations. Please be assured that this is very very rarely an issue. A Number 1 Party.com rep will contact you via phone or email within 24hrs of your reservation. Have a great time with this Giant School Bus Bouncer. 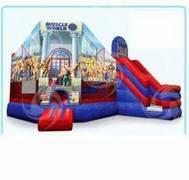 Double decker jumper and double slide with tunnel outside under the hood. 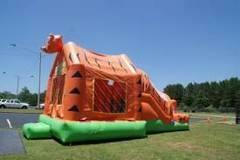 !Bounce, climb and slide. ***ATTENTION !! Your reservation is not completely confirmed until a Number 1 Party.com rep contacts you. WHY? Because sometimes rides are available but there is not enough workers to get the rides in all the different places. For instance we could have a bunch of parties in Birmingham and you could reserve a ride in Stevenson and that could be a situation where we are to spread out with our workers. We do however try our very best to fulfill ALL our online reservations. Please be assured that this is very very rarely an issue. A Number 1 Party.com rep will contact you via phone or email within 24hrs of your reservation. 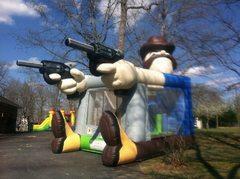 There is a new sheriff in town !! Book this brand new AWESOME combo ride today ! 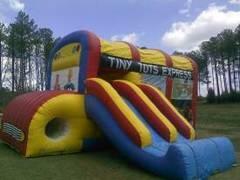 Bounce, climb, slide and run thru the obstacles and hide in the cave all for only $245 ! !